Allusion to the top leader of China in general, and at present to Xi Jinping. Implies that the head of state was anointed, not elected, to a position far more powerful than a modern head of state. Earlier last year, the Communist Party anointed Xi as a “core” leader, granting him a level of authority that had not been bestowed on his immediate predecessor, Hu, and advancing him to the revered ranks of Mao and Deng Xiaoping. Already the head of the Party, the military, and the state, Xi has also made himself the head of several commissions, which allows him to weigh in on everything from economic reform to state security to cyber issues. To be the core leader and the chief executive licenses him to play an almost imperial role in shaping the fate of the nation. 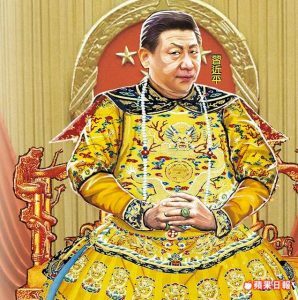 As Xi has made clear from the outset, he is intent on both defining a new world order and restoring to Chinese culture its former esteem. At the beginning of the 19th Party Congress, it became clear that Xi’s name would likely be immortalized by being amended into the CCP constitution alongside Mao’s and fellow formidable former top leader Deng Xiaoping’s. This development lent credence to ongoing comparisons of Xi with his exceptionally power-laden predecessors. CDT first detected that “reigning emperor” was blocked from Weibo search results on August 21, 2014. It remains blocked as of October 20, 2017.